Let’s all admit it, at one point or another while opening a bottle of wine, we’ve all wondered what the heck that foil capsule was doing on the bottle. While a bottle would look naked to us without one, does the capsule actually serve a purpose besides causing us to complete an extra step on our way to freeing the wine from the bottle? And what’s the proper way to remove it in the first place? As it turns out, the capsule’s existence on present day bottles is now simply decorative, left there because it’s always been there historically, but its original creation served two very interesting purposes. When wine was first put into bottle long long ago, it was often stored in very dark and dank cellars. These cellars were the perfect temperature for storing and aging wine, but their environment was also ideal for all sorts of little critters and pests to call home. With many of these critters and pests being fans of wood, the corks that were used to close these resting bottles were the perfect snack, which might have been delicious for the pests, but was terrible for the wine – no one likes a leaky cork. The capsule prevented this snacking from happening – you can’t snack on a cork you can’t access. These days, however, wine is often stored in state of the art cellars that are fairly free of pests looking for a snack, so the capsule isn’t as necessary as it once was. The second reason often given for the capsule’s initial creation probably makes a bit more sense – to stop shenanigans. In the same way Rioja producers started wrapping their high-end bottles in wire in order to stop counterfeiters, the capsule achieved a similar goal – it prevented someone from pulling out the cork and replacing a high end wine with plonk without the owner of the bottle knowing. Not everyone in the Downtown Abbey era was lucky enough to have a butler like Mr. Carson, and some of those butlers were known to pop a cork or two of the master’s wine to enjoy for themselves, refilling the empty bottle with something of lesser quality, and then recorking it, with no one being the wiser. But with a capsule on the wine, pulling the cork without anyone knowing wasn’t as easy, meaning only people who were willing to get truly creative could keep sneaking a taste. However, as wine has evolved the capsule isn’t as necessary as it once was, and some winemakers are even beginning to stop utilizing it, preferring to keep the cork exposed for either aesthetic reasons or out of a desire to reduce waste. But currently these winemakers are in the minority, which means it’s very likely that most bottles you’ll encounter will still have a foil capsule over the cork, meaning you’re going to have to remove it if you want that wine in your glass. The easiest way to remove the capsule is to simply pull it off, and while that’s what we do quite often, it’s not how you’d see it done in a restaurant. 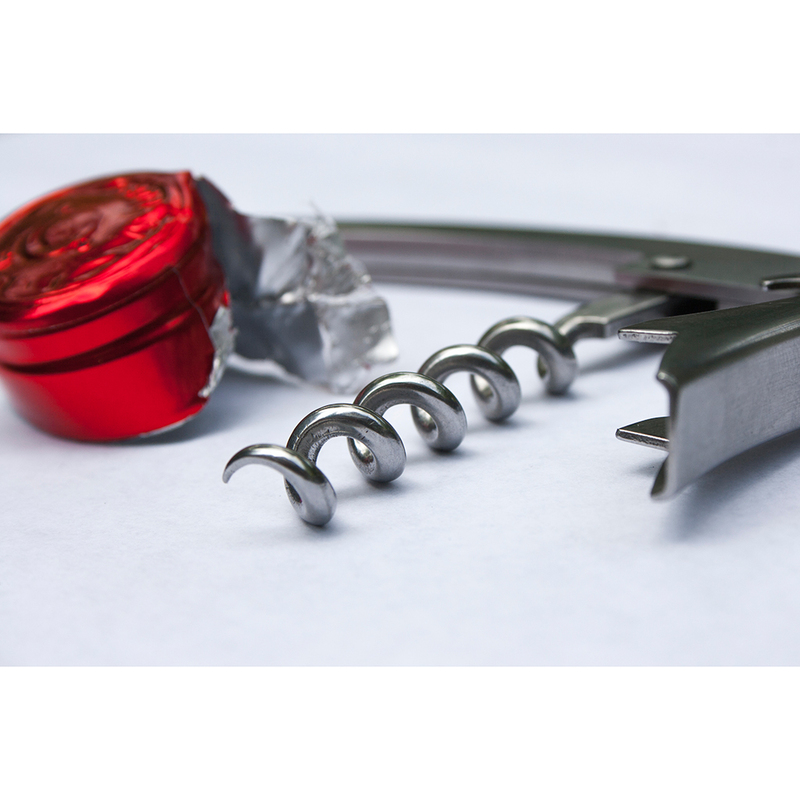 If you were dining out, your server would use the tiny knife attached to the corkscrew to run the blade around the top of the bottle, just under the lip, which would allow them to pull off just the small top part of the capsule and access the cork. This method leaves the majority of the packaging intact – got to preserve the branding after all – and is considered proper etiquette. Though no one will fault you for simply pulling the capsule off if that’s what you prefer – obviously getting to the wine is the end goal.